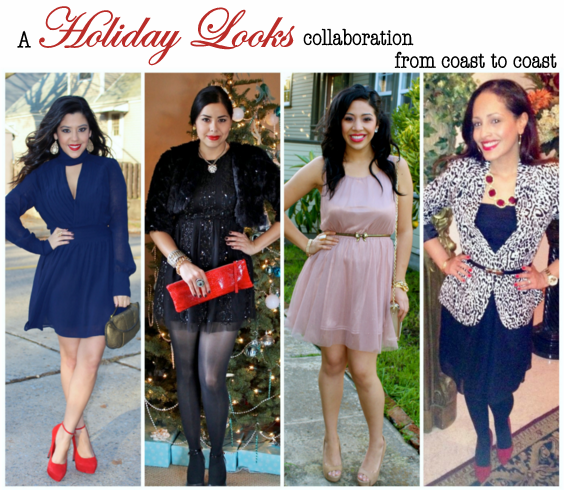 'Tis the Season for dressing up, being with family and friends and what better way to share the spirit of coming together than with a collaboration with some of my other favorite bloggers from the West Coast to the East Coast! This is a great way to show diverse looks in different temperatures. Make sure to check out these fashionistas & follow their wonderful blogs and instagrams! Naty from A Love Affair with Fashion based out of New York/ New Jersey Area shows off a gorgeous Navy dress with great details accessorized with pops of color. 'Tis me! based out of Sunny San Diego, California wearing this little black dress with sequin patterns that has been in my closet for ages! It's one of those dresses I can't let go of because it doesn't go out of style. I added a faux fur coat and opulent accessories to give it a Gatsby vibe (can I just say, I'm anxiously waiting for that damn movie to come out already!). Daisy from Daisy's Fashion Garden based out of the Bay Area, California brings a whimsical feel in this flowy rose dress with gold accents. Melissa from Melissa's Sweet Style based out of New Jersey brings such elegance with a gorgeous print blazer and touches of red. Wow...all of you look so glamorous and GORGEOUS! I especially love your look, Pau. You look beautiful! Your look has to be my favorite!!!! I LOVE it ALL!!! The fur, the clutch, and that dress is a stunner! Wow you look AMAZING! Just amazing. So festive and gorgeous. Super cute look, I definitely see myself wearing this outfit. I love your outfit!!!! So festive! You look great! 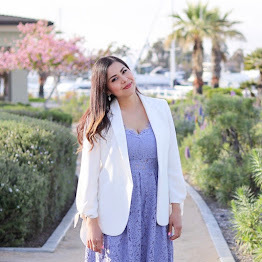 Really liked your idea of showing the outfits of fellow bloggers! My favourite dresses are the navy one and yours, from this last outfit, it is so party ready! Cute looks! The last outfit is great! the collab came out great so happy we did it! love your black dress! wow you look realy amazing!! stuning stuning!!! your outfit is amazing, definitely something i love for holiday!!! Adorable look! You're so sweet! Great collab! your look gorgeous! Thanks for the sweet comment on my blog =) Following you now via GFC, Instagram and Lookbook! Happy holidays paulina! I love that dress you are wearing and the presents look so festive under the tree. Oh my goodness, so many great looks! I love the red sequin bag! You have such a beautiful blog! I'm your newest follower! It would be awesome if you followed me back! que guapa!, me encanta tu propuesta, estás impresionante, el vestido es precioso y el recogido te queda espectacular como siempre, pasaba a desearte una feliz navidad!